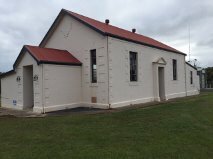 Allendale East Public Hall Committee invites the community to come along to an open day celebrating the rich history and future of this iconic community building and important meeting place. The Hall holds memories for many local families, it was a place where people gathered to share the most important parts of community life together. There will be Devonshire Teas, historical displays, CWA memorabilia, a trading table and a ceremony to mark the donation of exterior carriage lights in recognition of the Carlin families long history with the Hall. Everyone is welcome especially new families in the region who would like to get involved, create the new memories needed to ensure the future of our Hall for everyone to enjoy. The Allendale East Public Hall was built in 1910, a handsome structure built of limestone, measuring 50 x 30 feet with 16 foot high ceilings, plenty of light and ventilation. The land and the blocks of stone used to start the building were donated by local families. The community wished for a hall of their own to hold socials, public meetings and so on. The opening day in December 1910 was a celebration of what a small community can do when they work well together. The Allendale Hall has been a place for dances and romances, music lessons, weddings, parties, public meetings, celebrations, commiserations and even for indoor bowls and bingo nights. Many hardworking and dedicated people have volunteered their time and resources to manage the Hall. Things are changing; social media, technology and transport have impacted on how much the Hall gets used and current committee members are working hard to stay relevant and involve new families who have moved to the region. Every year a Christmas Tree Celebration is organised and the local children come together as one community to decorate the tree, sing carols, and most importantly create their own connection and memories of a mighty Hall that will stay with them wherever they go.